The platform's integration with with Zoom enables providers to conduct HIPAA-compliant group video chats, host webinars, and record sessions. Zoom is a HIPAA-compliant telehealth platform that enables group video conferences (up to 50 participants), allows providers to host webinars, and record sessions for future use. This integration is automatically accessible for members on Healthie's Practice Plus plan or above. To create webinars, you need to create a group appointment for the webinar in your calendar appointment types. You may choose to call it "Free Webinar." Click on the date and time you wish to schedule your Free Webinar. An appointment window will pop up. Be sure to select Group appointment at the top. 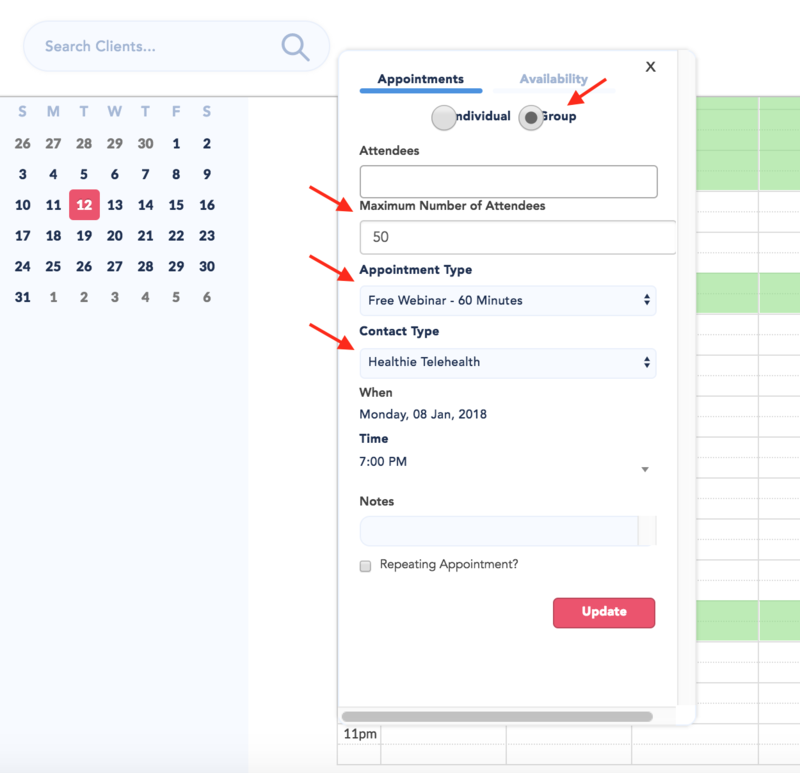 Be sure to set the "Maximum Number of Attendees" to 50, which is the limit for the HIPAA-compliant version of Zoom that is built in to the Healthie platform. Under "Appointment Type," select the "Free Webinar" appointment type that you just created. Last, under "Contact Type," select Healthie Telehealth. Then click "Create." Your webinar will now appear on your calendar. To view the details of the webinar you just created, click on the webinar scheduled. You will see "Your Video Link" to click to start your webinar. The "Client Video Link" is a link you can share directly with your clients to access the webinar. 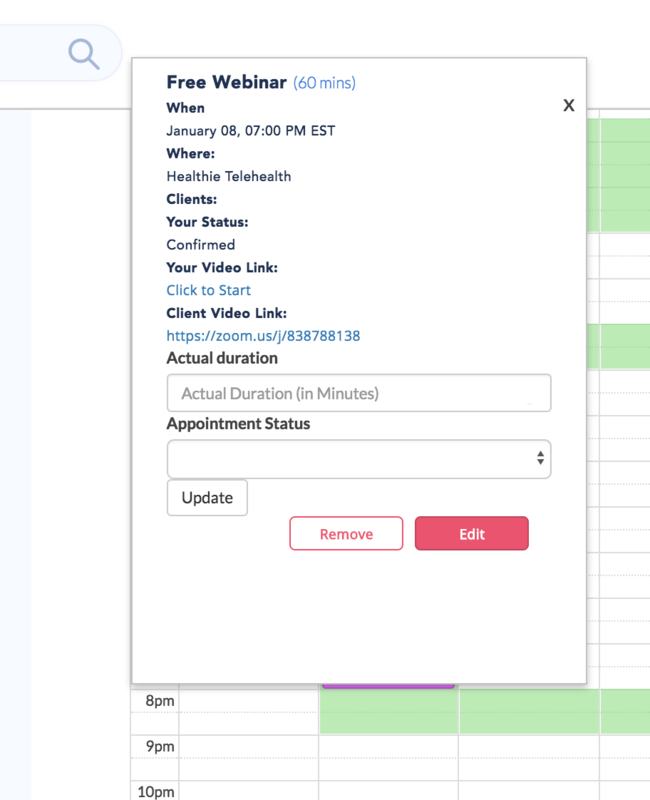 In the event you are using group webinars as a marketing feature, as many do, you should note that a participant can join a Zoom link regardless of whether or not they are a Healthie client. Finally, you'll create a package for the webinar. If you are offering your webinar free, list the package price as $0.00. 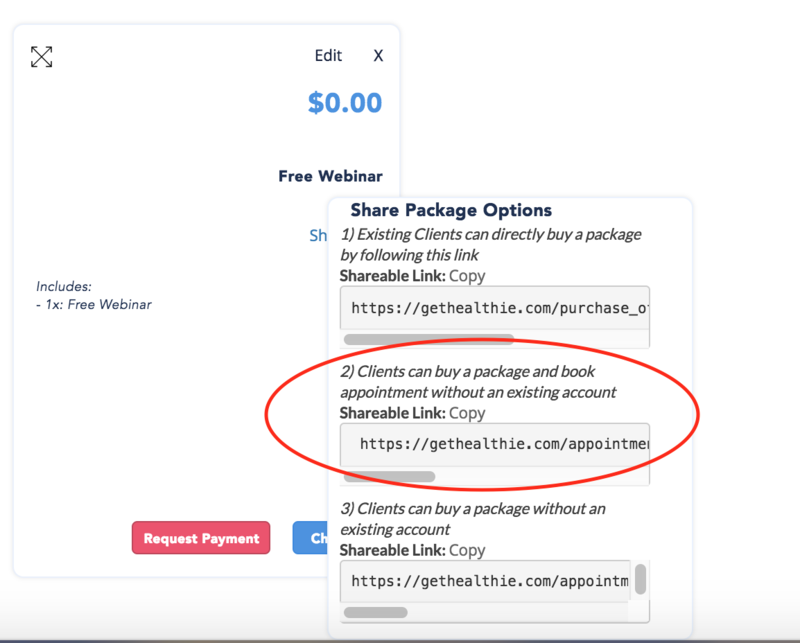 Once you create a package for your free webinar, you can promote it by using the 2nd share link (so clients can 'buy' and book). Add this modifier to the end of the URL: "&is_group=true"
When clicking on the Zoom link that you've generated above, you'll be prompted to download the Zoom App. Follow these instructions to ensure that the software is downloaded appropriately on your computer. If you conduct a video chat, group session, or webinar through Zoom, you are able to record it for future access. To access these recordings, follow these instructions provided by Zoom. The recording will save locally on your computer, commonly in a folder called "Zoom" -- please find this folder in order to access your recording. The recording will continue until you press "Stop" - additionally, when you exit the Zoom room, you will be asked to 'End the session". Here is a link to the Zoom Troubleshooting Guide if you are having issues setting this up.